Anna and Joe's wildflower wedding at Hall Barn - Joanna Carter Wedding Flowers | Oxford, Oxfordshire, Berkshire, Buckinghamshire and London. 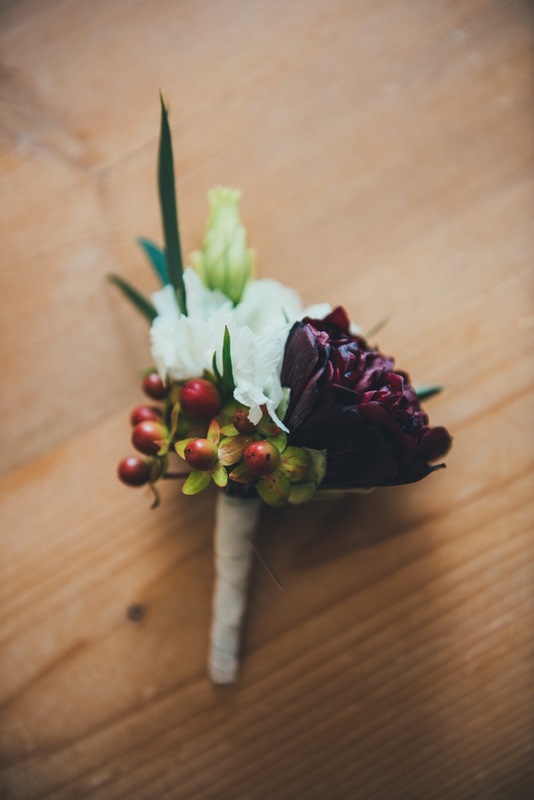 Anna and Joe asked us to give them wedding flowers with a difference. Informal, loose and wild and wherever possible including poppies, Anna’s favourite flower. 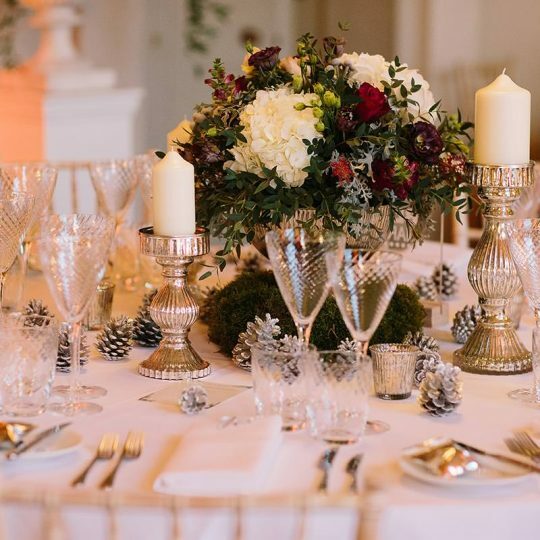 The colour palette was red, orange, yellow, cream and ivory with plenty of greenery. Anna asked us to try to avoid an autumnal look and to keep it looking as bright and summery possible. 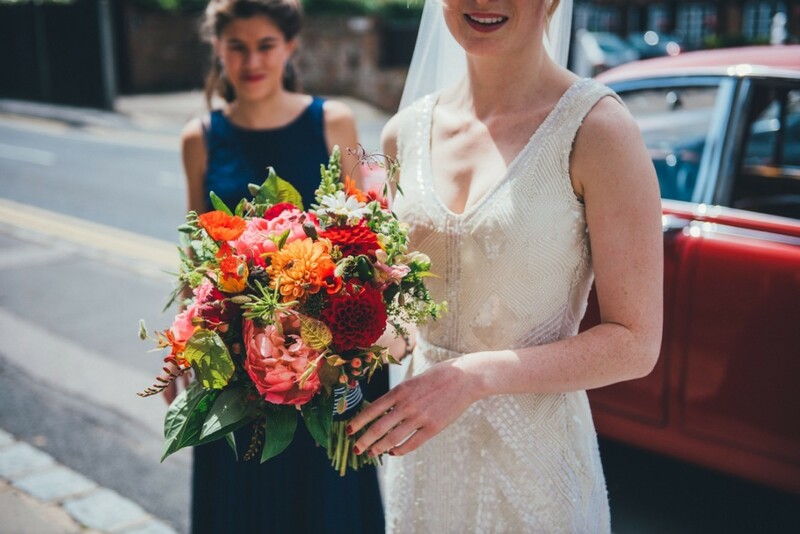 For Anna’s bouquet we used coral peonies, red and orange dahlias, daisies, cream antirrhinum, pink hypericum berries, alchemilla mollis, crocosmia and loads of mixed foliage. It was loose and informal and created a real statement. 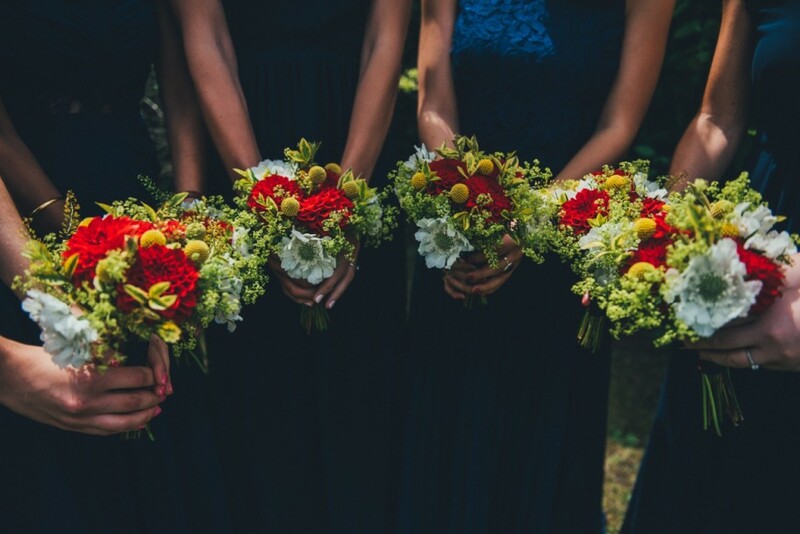 Anna’s bridesmaids carried bouquets of red dahlia’s , alchemilla mollis, yellow craspedia and ivory scabious which looked great against their navy dresses. 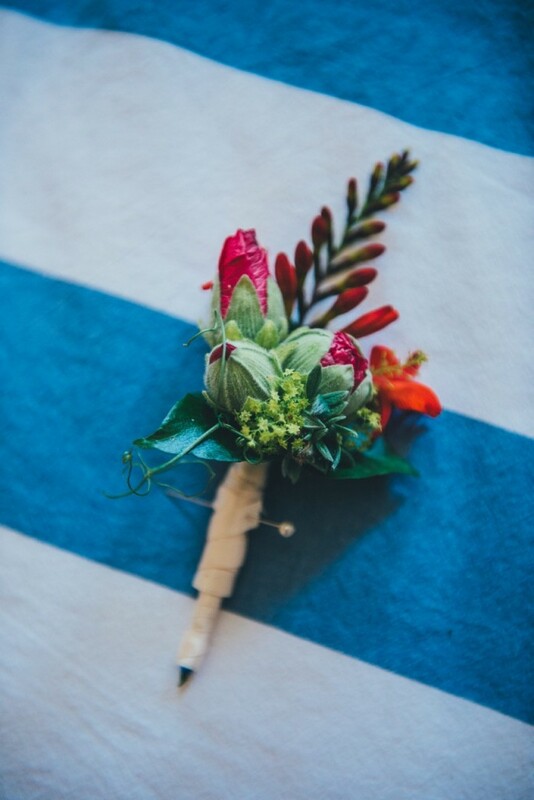 In keeping with the informal theme we made all the buttonholes different, all using mixed varied elements of the wedding flowers but each one unique! 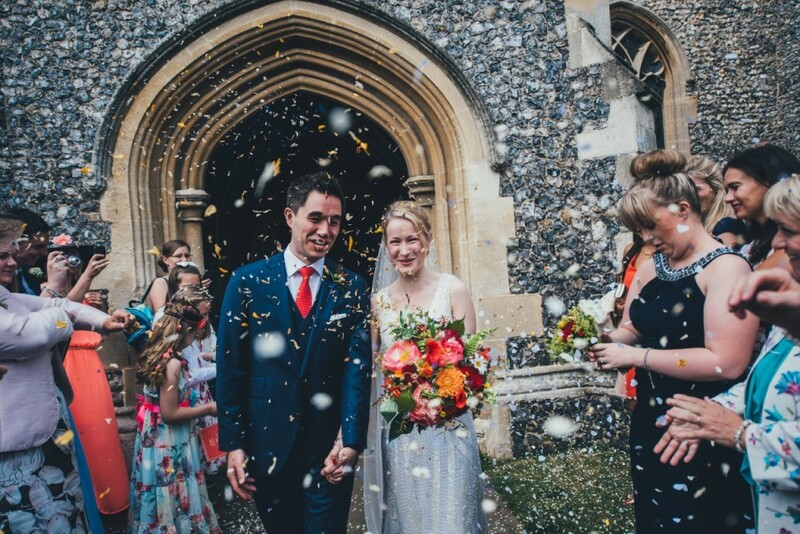 Anna and Joe got married in a church service in Amersham and then headed to Hall Barn in Beaconsfield for their Tipi reception. 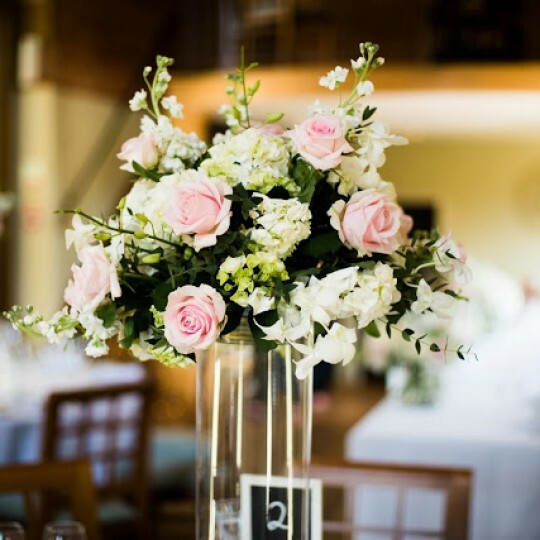 Hall Barn is a lovely hidden gem, little known and with acres of lovely grounds. It was the perfect spot for their tipi to be placed. 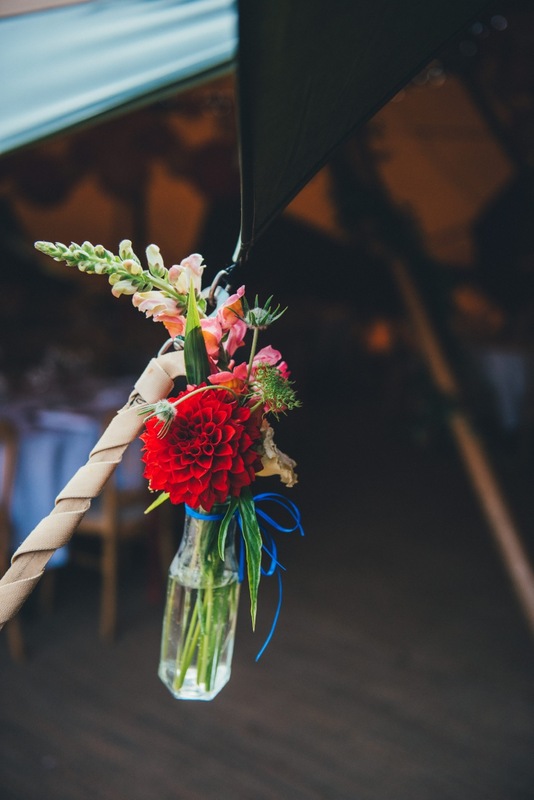 Anna and Joe asked us to decorate the venue with lots of jam jars full of informal flowers and to add more jam jars hanging from the poles and the ceiling of the tipi. We also made two huge arrangements in tall galvanised steel buckets to sit at the entrance to the tipi . We added giant stems of deep red and ivory hollyhocks and ivory larkspur to these for impact. We loved working on Anna and Joe’s wedding. 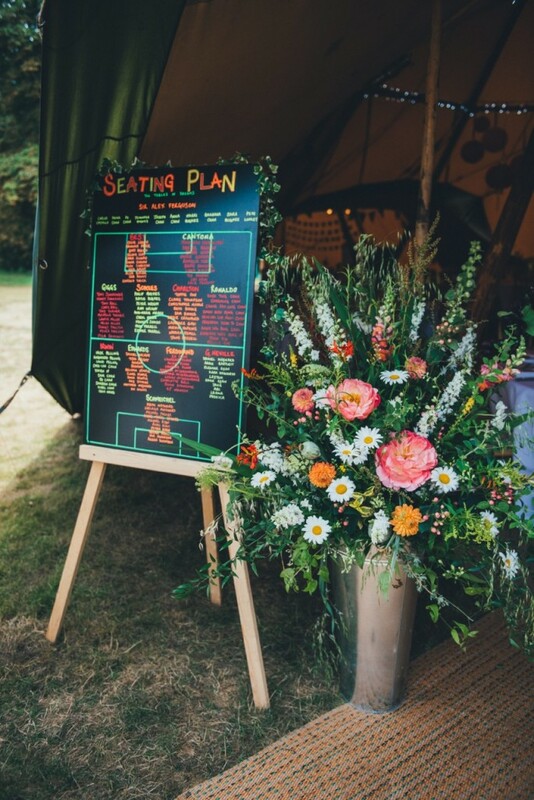 The colours and flowers looked great and the fun touches throughout their day, like chinese lanterns hanging from the ceiling, the football inspired table plan and table names and the Bake Off table for guests home baked puddings to be displayed on all made this wedding brilliant fun!